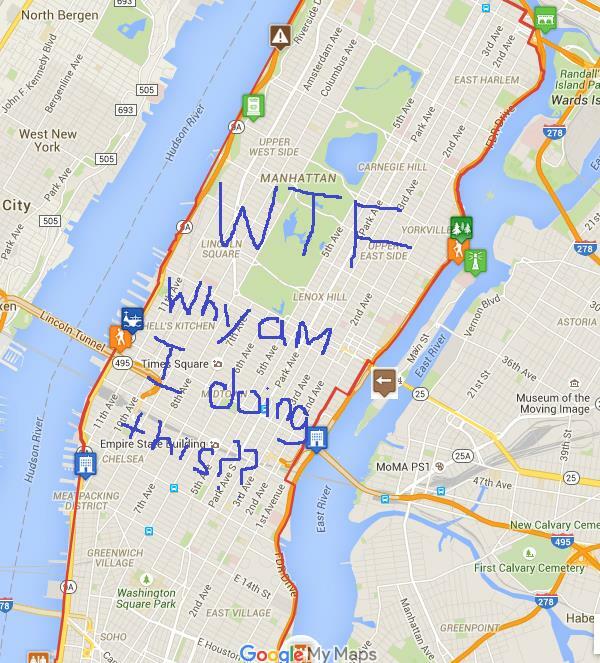 On Saturday, my friend Drew and I walked 28 miles around the perimeter of Manhattan. Why? Because we’re idiots. It’s called The Great Saunter. Every year a bunch of people get together, raise money for charity, and circumnavigate Manhattan. Drew and I had been talking about doing this for some time, but we didn’t want to wait until next year, so we just did it ourselves. We met at East 34th Street. 7am sharp. There’s an underpass there that gets you on the other side of the FDR Drive. And then we walked downtown, clockwise, along the East River. 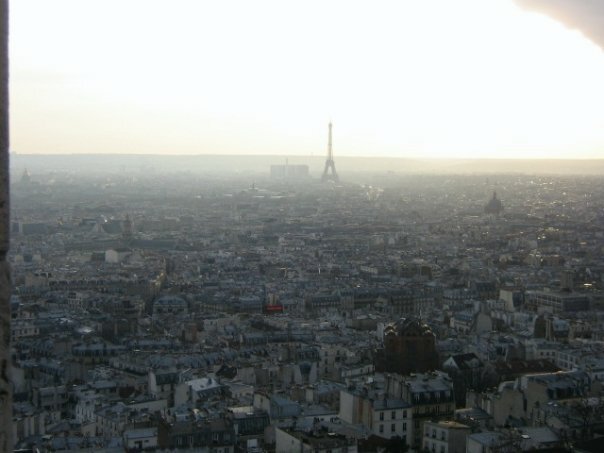 The sun rose and delivered a magnificent orange hue over this great big city. It was a chilly fall morning, but people were out jogging, walking their dogs, eating their bagel in the park. It was nice. We reached the southern tip of Manhattan by 9 and walked through Battery Park. Lots of stuff going on down there – 5k’s, walks for cancer, just people standing there for no reason. Who knew this city had so many people? And then we began the long walk up the West Side, over 200 blocks and 10 miles. The wind was howling off the Hudson. Somewhere around West 100th, the blisters started. OH GOD THE BLISTERS. Somewhere around West 150th, my knees started barking. By West 200th, I was having trouble walking. By that point it was 1 in the afternoon, and we had been walking for six hours, just shy of 20 miles. We reached Inwood Park, at the tippy top of Manhattan, around 1:30. It was there we found a dead end. We then walked east, through some hiking trails, and it was hard to believe we were still in Manhattan. It offered a brief glimpse of what life was like on this island a few hundred years ago. The trails deposited us around East 207th St. By that point, the blisters were seriously painful. My feet hated me. The human body is not supposed to walk this far, this long. Wow, you guys look baaaaaaad. At East 150th St, we had been walking for almost 27 miles. I could barely lift my feet off the ground. All I wanted to do was sit, anywhere, even in the middle of the street. We had to call it quits at East 125th St. It was almost 4 in the afternoon, and we had been walking for nine hours and 28 miles. We “only” had 90 blocks to go to complete the full loop, but both of us knew we weren’t going to make it. I managed to get myself home in one piece and then slept for the next two days. Was it a good experience? Sure. Was it cool to see the city from so many different angles? Yeah, I guess. 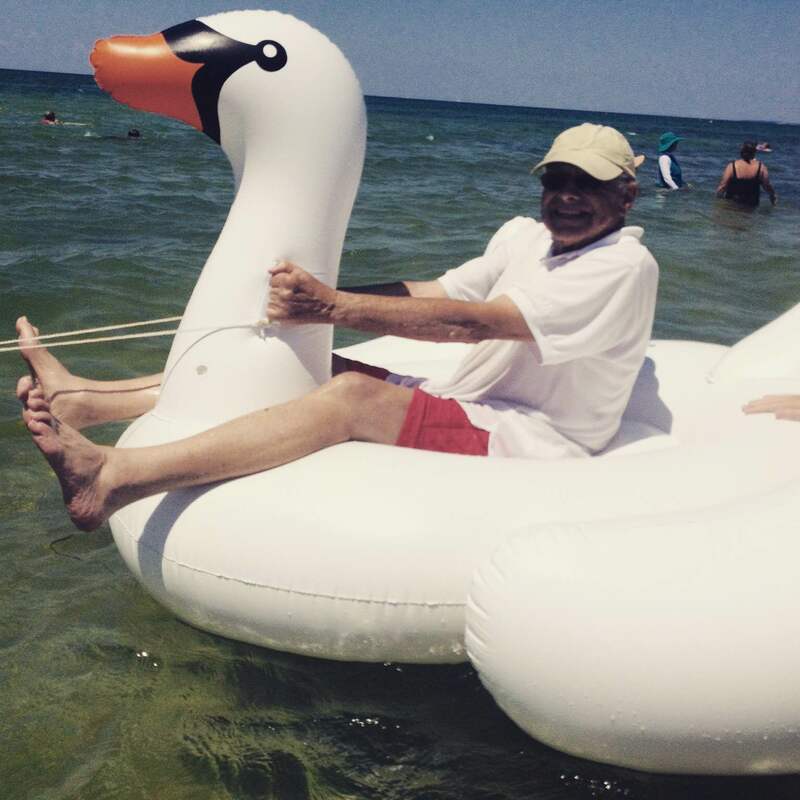 But, I’m not going to sit here and claim that despite the pain, the whole thing was worth it. It wasn’t! It really wasn’t! Don’t ever do this. Your body will hate you. Your feet will want to secede from your legs. Your spirit will be drained. You will probably get lost. STAY AWAY AND DON’T EVER THINK ABOUT DOING THIS. Manahattan is a big, biiiiig island, and we’re not supposed to walk around it. Everyone has a story, as vivid and complex and weird as yours. This isn’t something you think about when you walk down the street, passing dozens of strangers that you’ll likely never see again. But it is inherently true. They all have stories. You are not the main character. You are a small piece in a sprawling, chaotic world. There is a website – and now a YouTube channel – called The Dictionary of Obscure Sorrows. They wrap profound concepts into tiny little word packages. And they call this sonder. I really dislike the word millennial. I dislike it for a few reasons. For one, the word comes with a certain stigma. Young, spoiled, pretentious, entitled. For two, I think Gen Y sounds cooler. For three, it’s four syllables, and I’m not a fan of any word with more than three syllables. For four, I think the whole concept of generations (The Greatest Generation*, The Silents, Baby Boomers, Gen X, Gen Y) is ridiculous and just a completely arbitrary construct. *You want to talk about pretentious? How about referring to your collective selves as the GREATEST GENERATION. The art of conversation is almost a lost one. People talk as they ride bicycles – at a rush – without pausing to consider their surroundings. What has been generally understood as cultured society is rapidly deteriorating into baseness and voluntary ignorance. OK, listen, I know we talk fast and we text a lot and we sometimes … oh no, wait … that’s not from the New York Times, that’s a quote from Marie Corelli in 1905. Our youth now love luxury. They have bad manners, contempt for authority. They show disrespsect for their elders. Alright, bro, I know our manners aren’t the best and we’re sometimes disrespectful and we tend to … wait a second, that’s a quote from Socrates in 500 BC. A hundred years ago it took so long and cost so much to send a letter that it seemed worth while to put some time and thought into writing it. Now the quickness and the cheapness of the post seem to justify the feeling that a brief letter to-day may be followed by another next week – a line “now” by another to-morrow. 1. Every generation hates the generation that comes after it. 2. The reasons are similar. You think that the pace of modern life is too fast and the world is changing too quickly and everyone is spoiled and no one can have a conversation, but what you don’t realize is that everyone has been saying that forever. I think this cycle plays itself out over and over again because: as you get older, you start to feel like you don’t matter anymore. You see new technology and new slang and new ways of doing things and you think, Jesus, this is so different than what I’m used to, this is terribly confusing, this doesn’t feel right, this is uncomfortable. Heck, I feel this way sometimes and I’m 24 years old. But this type of thought process lends itself to criticizing an entire generation, with supremely broad strokes, just like Socrates did in 500 BC and some random woman named Marie Corelli did in 1905. And of course the cycle continues to play itself out today. 24 year old: Do you want your kids’ world to be a step above yours? Isn’t that what we’re all doing? 24 year old: So, doesn’t it follow that if you’re a good parent and your kids evolve and are smarter than you, they’re gonna make you feel kind of dumb? Louis CK: Yeah, yeah, I guess so. 24 year old: So if you feel stupid around young people, things are going good! Whenever I see some writer or TV talking head complain about this generation, my immediate reaction is a cringe. I feel embarrassed for them and wouldn’t want to come off that way myself. I think it’s important to stand up for people, not tear them down. And then I sing The Who. That was written 50 years ago. IN CONCLUSION … I think it is good to be optimistic, I think it has never been in your advantage to discount the generation that comes after you, I think the world will be OK. Like always, humans will figure out a way to survive. We’ll be fine. 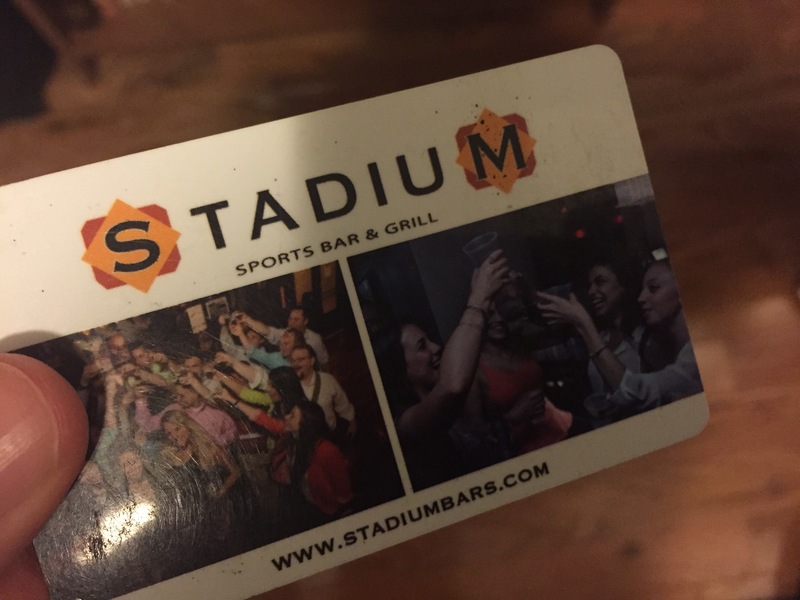 A few months ago, some co-workers and I went to Happy Hour* at a bar called Stadium. We hung out, we chatted, we ordered some drinks, and all was well. *Massachusetts actually implemented a state-wide ban on Happy Hour in 1984 that still stands today. The idea was that by eliminating promotions with special low-priced alcoholic drinks, there would be fewer incidents of drunken driving. So Happy Hour is technically illegal here, but no one really follows that. About an hour after we arrived, some dude walked into the bar, pounded fists with the owner, and set up a game of Team Jeopardy in the back. We signed up. There were maybe ten teams, and we didn’t think we’d win or anything, but at the least it would be fun and something to do. Well, we dominated. Turns out, we’re really smart and know a lot of things! After the victory, the guy that was running Jeopardy set up a prize table and was basically like, “Uh, yeah, you can take whatever you want.” I cleaned up. I got a shirt, a hat, some gloves, and a $50 gift card. A week later, I went back to Stadium, happy as a clam and prepared to buy the whole city of Boston a beverage with my new, shiny gift card. The bar was boarded up. It was totally empty. There was a sign on the door. They went out of business. And now I have a stupid, pointless gift card sitting in my wallet.